I live in West Sussex, very close to the South Downs and the beach. My surroundings are a big influence on my work; especially the Downs which I use aerial views of and explore the changing landscapes through the seasons. I develop my ideas through drawing, print and paint within my sketchbook of ideas; using the inspiration from natural objects, the human figure and corroded surfaces. I love corroded surfaces, the contrast of rough and smooth lines, patterns and textures that are found on stone, wood, glass and metal that has been weathered and broken down from natural erosion. I enjoy seeing and scapes change and evolve from month to month and the effects that farming has had, leaving patterns by man and nature. What makes my work unique is that each piece is individual and a real one off, the pattern, texture and form of each piece is different due to the way i create them. The work changes each time you look at it or move around it, there is always something new to see. My work is a combination of contemporary ideas with traditional making techniques. The work can take many forms which include vessels, sculptures, pieces of jewellery and wall hangings. 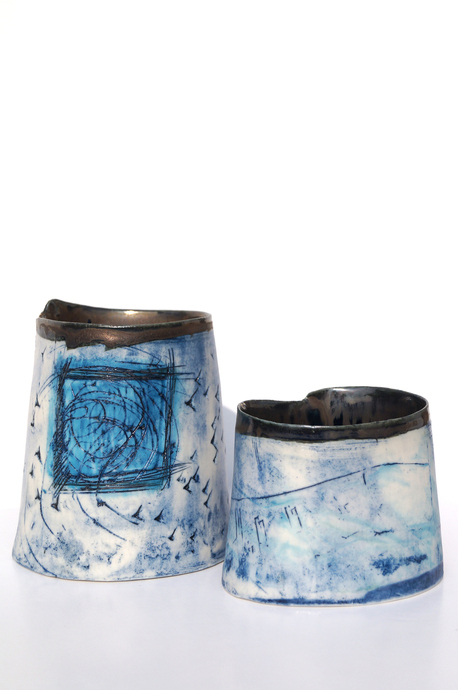 Each piece is handbuilt using either stoneware or porcelain clay that has been washed over with oxides and/ or coloured slips to highlight the textures that are already on the surface.